Hi and welcome to my Halloween Spooks page. If you got here through a webring, my name is Kate and I am a Halloween FREAK! :) I also make web pages. So, since Halloween is my favorite holiday, I figured I should make a Halloween site..
All in one link..Here is the Halloween Spooks Photo Album! Here are some costume ideas; stuff that I have been, stuff I've seen, pics where available. Here are some More Drink Recipes, courtesy of The Basement Bar. Here's a link to find a Haunted House in your area! 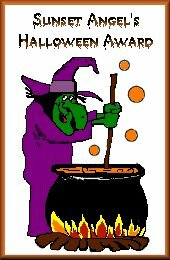 Check out my Ghoulish Recipes page! In need of some Terror-Inducing Party Ideas? Check out this link! Want to make some Fake Blood? Look no further! 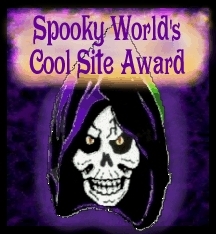 Click here to visit Fright Site Fights! Check out my other dark site, Kate's Gothwannabe Page! want me to remove it, please email me and I will be happy to oblige.